To celebrate the American Library Association's upcoming Banned Books Week, we're writing about Authors of Banned Books for each post this week. Today, our spotlight is on Robert Cormier. Cormier, an American author who lived 1925 - 2000, was a lifelong writer most famous for the bestsellers The Chocolate War, I Am the Cheese, and After the First Death. Cormier's most well-known novel, The Chocolate War, has been appearing on the ALA's top 10 list of most challenged books for over a decade. While The Chocolate War has been hailed as a profound and beautifully written book for the teen audience; the novel's explicit language, sexuality, and anti-establishment tone have made it the target of frequent ban or censorship attempts. 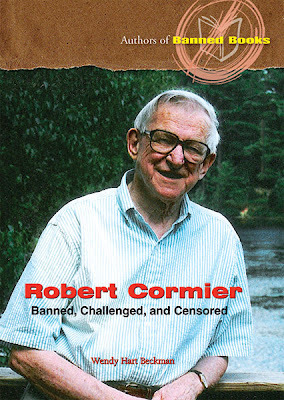 To find out more about either Robert Cormier or the many challenges faced by his books, check out Enslow Publishers' Robert Cormier: Banned, Challenged, and Censored, by Wendy Hart Beckman provides a thorough biography of Robert Cormier and a full discussion of why The Chocolate War and Cormier's books were banned or challenged.